Buildablock will deeply satisfy any child or adult who has an interest in building and construction machinery. It is bright, busy, sophisticated and humourous. In Buildablock we meet an inquisitive boy and girl peeking through the holes in a fence surrounding a city construction site. They can see so many workers, both male and female, and wonder what they do on the construction site? During the story we find out what the workers do and which machines they use to help them complete their jobs. There is also a story within the story. Illustrator Peskimo has added a pigeon to the story who also wants to discover what is going on. Children will delight in finding the pigeon who is hidden on every second page. The pigeon is able to take a close up look at the construction site, including inside the ditch made by the trencher. There are spots of humour involved with this little character who even participates in the lunch break on the construction site. Inside this 90 page board book readers will discover over 24 construction machines behind the flaps. The book includes all the traditional machines like the bulldozer, dump truck and excavator but it also includes more modern machines like the tunnel borer. 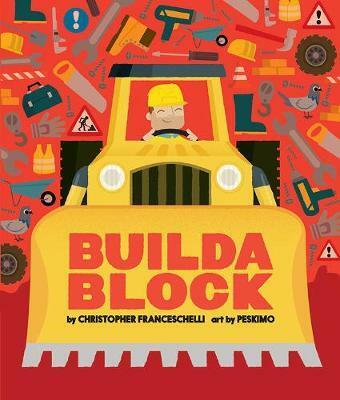 The author, Christopher Franceschelli, introduces readers to not only vocabulary of construction machines but also construction materials eg. asphalt, girders and beams. Peskimo's illustrations are detailed, energetic and inclusive. Children will discover male and female workers sharing many of the jobs on the construction site including operating the machinery. The illustrations can encourage conversation about simple shapes such as circles, rectangles and triangles but also allows for discussions about more complex shapes eg. hexagon, parallelogram and quadrilateral. Buildablock is a delightful board book in the Block Books series which includes the books; Alpha Block, Counta Block and Dinioblock.